The Eagles get a 3rd game with Dallas at home to determine who goes to the Super Bowl. New Orleans falls to an overall 11-6. New Orleans falls out of the top seed in the NFC and goes to 11-5, giving that honor to the Bears. The Rams finish 7-9. San Diego one step away from perfection at 15-0. New Orleans drops to 11-4 but still clinches home field in the NFC with a win next week. New Orleans now 11-3, Oakland to 5-9. Atlanta moves up to 6-7, New Orleans is still playoff bound at 10-3. New Orleans still the top dog in the NFC at 10-2, Seattle at 8-4. The Saints go to 9-2, while the 49ers fall to 4-7. A big win for Denver to move them up to 7-3, while New Orleans falls to 8-2. For most of the game, it looked like the Washington Redskins had a plan to derail the high powered New Orleans offense, holding a lead into the fourth quarter. But the Saints got hot with a flurry of points that proved to be enough as they held off a late Redskin charge for a 24-21 win. Chuck Muncie of the Saints had an impressive effort to take the MVP award. He ran for 115 yards on 29 carries for a TD, and also caught 8 passes for 88 yards, including another TD. The Saints move up to an impressive 8-1, the Redskins fall back to 5-4. Archie Manning took Player Of The Week honors for Week 8. Four touchdowns in a seven minute span triggered an offensive explosion by the New Orleans Saints as they demolished the Detroit Lions by a count of 52-21. 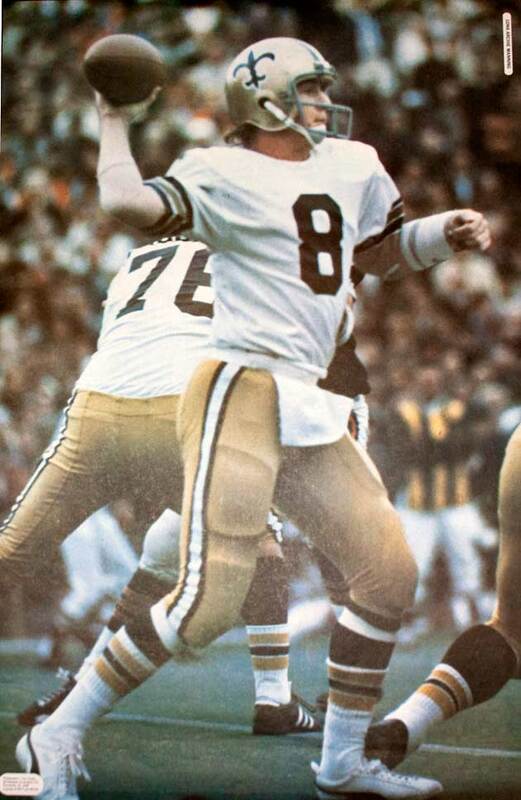 Archie Manning won the game’s MVP award. He threw for 507 yards, completing 35 of 50 passes, 6 for TD’s, and also ran in a score. The Saints move to 7-1, the Lions still seek their first win at 0-8.